The aborted take-off from Luton Airport should probably have served as an omen that the trip was not going to go smoothly. I was heading for Strathcarron to resume my walk across Scotland along the Cape Wrath Trail, having started in Kirk Yetholm the previous year, but now found myself sat on the runway along with all of the other passengers wondering what was going on. I had relaxed back in my seat as the plane lurched down the runway and the engines roared into life when suddenly the power was cut and an announcement come over the tannoy saying that the take-off had been aborted for 'technical reasons'. This slightly unnerving news was followed by a wait of around an hour on the tarmac while the problems were dealt with, which was very annoying as the flight was already almost an hour late taking off. We eventually took off nearly two hours late and I was soon sitting with my rucksack at the bustop at Inverness Airport waiting for a bus into the centre of the attractive Highland capital before taking the opportunity in joining three women in a taxi-share, which certainly saved time and as there were four of us, probably didn't cost any more than the bus. I was staying in Inverness overnight as I needed to get various items for the trip plus I didn't fancy starting the walk during the afternoon, which it certainly would have been after the delayed flight. The following morning, I caught the train to Strathcarron on a cool, very overcast and blustery day and soon found myself standing by the hotel where I had finished my walk the previous year. There are a number of routes that can be taken on the Cape Wrath Trail from Strathcarron to Kinlochewe, the tiny village located in the shadow of Bienn Eighe , but as it was already 11am when the train pulled into the lonely outpost by the hotel, I had already decided on the fast and direct route initially along the River Carron to the road which I then planned to follow for a few miles to Achnashellach Station. The train had passed through here just before arriving in Strathcarron and I had briefly toyed with the idea of getting off and missing out the section from Strathcarron but couldn't bring myself to do it. In any case, I was fairly sure it was a 'request stop' and wasn't sure what the procedure was for halting the train. The road was fairly quiet and the fast walking gave me a chance to 'warm up' and I soon found myself back at the tiny request halt on the railway line, which I crossed before climbing into the forest as the views of Loch Dughaill and the surrounding mountains opened out before me. Before long, I reached the Coulin Pass and enjoyed the views to Bienn Eighe as I descended to Coulin before climbing once more over to Kinlochewe. Here, having confirmed that the hotel had no vacancies, I walked the mile and a half to the campsite at Taagan where I pitched my tent before returning to the village for a meal in the hotel. That night, I was jolted awake by a strange sound and lay there in the dark listening as it was repeated, this time much closer. I then had a flashback to a hiker's blog I had read of his experience camping in the very spot where I now lay and remembered his comment about red deer stags 'roaring' throughout the night. The sound was repeated a few times, each time closer to the tent before it ceased and I settled down to go back to sleep. It was then that I noticed a pain in my throat and the fact that I was having difficulty swallowing. This was not good news! For me, cold and flu viruses almost always start with a painful, sore throat and it appeared that I had contracted something on the flight over from Tenerife, three days earlier. The following morning, I woke early and emerged from the tent to a heavily overcast, grey day with billowing blankets of thick grey cloud obscuring the surrounding mountaintops as I made coffee and began packing my rucksack. I was soon walking back to Kinlochewe as I tried to remember where I had packed the painkillers for my now very sore throat. I sat on a bench outside the hotel where I had eaten dinner the night before and managed to log into their wi-fi to send my wife a message before heading off towards the Heights of Kinlochewe and Gleann na Muice. The forecast was for fog and strong winds and rain on the mountains but now, all was calm, albeit very overcast and grey. I plodded along the track for some kilometeres before it began to climb into the Gleann na Muice and after passing a couple of small lochans, eventually arrived at Lochan Fada, a more substantial body of water, which signalled the end of the path. By now, it was beginning to rain and as I climbed into the mist, I switched on the GPS on my phone and as I was swallowed up into a grey, featureless world, watched a lone walker off in the distance heading in the opposite direction, which only served to emphasise my feeling of isolation. Climbing steadily, the rain became more intense and as I crossed a river, I checked my GPS and realised that my battery was extremely low. Retrieving the power pack from my rucksack, I plugged it in and re-oriented myself and headed off in what I thought was the correct bearing but I seemed to be drifting away from the trail on the screen. The words in the 'North to the Cape' guidebook, which stated that it was 'crucial' to get the correct bearing at this point to avoid descending into the wrong valley, came drifting back into my mind as I approached another river. Looking across to the other side, I could see a small loch in the distance as the mist lifted slightly and I breathed a sigh of relief. 'This must be Loch an Nid', I thought, as I crossed the river in front of me. Once on the other side, alarm bells began ringing in my mind as I realised I had just re-crossed the river I had crossed earlier. Also, I had simply assumed that the lochan I had seen in the mist was the one I was looking for. At this point, despite the rain, which was now quite heavy, I stopped and took out the map and compass. I knew I was in the vicinity of Bealach Na Croise so took a bearing to Loch an Nid and discovered that I was going in completely the wrong direction! Somehow, in the mist, I had managed to turn 180 degrees! As I crossed back over the river, the mist lifted a little and I could now clearly see the valley I needed to descend into and with relief, began heading downhill on an intermittent path. Soon the loch came into view and as I walked along the shore, I stopped and turned around in a circle, I was completely surrounded my mountains, the feeling of total isolation almost overwhelming. Having now crossed the bealach, I stopped for a break alongside the Abhainn Loch an Nid river before continuing to a junction of paths. Here, I left the valley on an initially steep track as superb views opened out into Strath Na Sealga. As I descended to Corrie Hallie, two or three groups of walkers passed me heading for the Shenavall bothy before I eventually reached the road and found a spot to camp alongside the Dundonnell River, I had been walking for 10.5 hours. As is usual when camping, I was up at around 6am to be welcomed by a stunning, clear blue sky and fantastic views to the An Teallach range. After a quick breakfast, I packed my rucksack and began climbing, initially through woodland before stopping briefly by an attractive waterfall to enjoy even more stunning views to the impressive mountain range. The path now crossed some fairly boggy moorland to the shore of Loch an Tiompan, which looked superb in the sunshine and I watched scores of flying insects apparently 'dancing' up and down in the golden light of the early morning sun. I have no idea what they were but I stood for a few minutes entranced by their aerial display. Continuing, I began a long, very steep descent to the Ullapool road as Loch Broom appeared far below. I had decided to stay overnight in Ullapool and was torn between walking the seven miles along the A835 road or hitching a lift. I decided to wait until I reached the road before making a decision but in the back of my mind I knew I would walk. As I descended, I had a moment of confusion as a mountain-biker I had spoken to on reaching the road at Corrie Hallie the previous evening, appeared below me pushing his bike uphill. The confusion was cleared up when I spoke to him and discovered that the biker I had spoken to the day before was a friend of his who was similar in appearance and had an identical mountain bike, which was very distinctive because of the huge, fat, off-road tyres. They had parted company, he said, 'because his friend's pace was too much for him', so he had stopped overnight in Ullapool while his friend headed for Shenavall bothy. I wished him well and continued my descent to the A835. The walk along the road was not the most pleasant but I found a grass verge the whole way and walked along this whenever traffic passed by. After a couple of hours along the road, I reached Ullapool and headed for the tourist information centre who found me a room in a nearby hotel. My first port of call after dumping my gear and having a shower was to Boots the chemist to get some medication for my throat, which was really starting to trouble me and had begun to develop into a cough and I was now becoming concerned that if the problem developed further, it may jeopardize the walk. The following morning, my sore throat had developed into a really bad cough and every now and again, I would have a fairly spectacular coughing fit. The cough was very dry and even after a bout of coughing, I still felt as though I was about to start over again, which I did often. I left Ullapool on another fabulously warm, sunny day and headed past a quarry to follow a narrow, tarmac lane around the shore of Loch Achall. This eventually petered out into a track but the walking was easy and thoroughly enjoyable and I stopped regularly to take photos. I wasn't expecting too much from this section as it was an alternative solely for those who, having diverted into Ullapool, needed to return to the main route. The walk however, was a delight the whole way although at 19 miles, quite long. After stopping to talk to a couple out riding their mountain bikes along the track, I spotted a lone figure with a backpack ahead of me. Assuming it would be a daywalker, I caught him up and was surprised to find it was a young hiker doing the Cape Wrath Trail. This was the first time I had actually met anyone walking on the trail and we walked together to Knockdamph bothy, where we stopped for a break. The company made a change and I enjoyed having someone to talk to, a unique experience for me on the CWT. After the bothy, the walker went on ahead as I stopped to get something out of my rucksack. I took his comment of, 'I'm going to crack on a bit' when I stopped to mean 'I want to walk on my own for a while' and let him get well in front before setting off again. Eventually, I caught up with him again resting by a river and we then walked the rest of the way together to Oykel Bridge where we set up camp on the riverbank with an English couple also walking the trail who had been resident in France for a number of years. The evening was spent in the bar of the Oykel Bridge hotel and it seemed odd to have gone from having no company at all since starting the CWT to sitting with three others in a bar and having a common topic of conversation. I returned to my tent and spent an uncomfortable night, which was disturbed by the constant nagging cough that was now increasingly becoming a problem. Just as dawn was breaking the following morning, I was awoken by a drip of water on my head and climbed out of the tent to discover that it was absolutely dripping with condensation. The time was 4.15am and because the forecast had predicted the possibility of thunderstorms, I had decided to get off at around 6am to hopefully get across the mountains to Inchnadamph before they started, so I decided that as I was up and it was getting light, that I may as well take advantage and packed up and was back on the trail by 5am. The first part of the walk was an easy romp along a track above the River Oykel and although I was feeling quite ill, I managed to keep up quite a good pace as the route was on level ground, at least for now. After the track descended to the river, it soon turned into a path and it was around here that the guidebook suggested climbing through the forest to pick up another forest track, but looking at the ascent, I decided I wasn't in the mood yet for any climbing and carried on following the river on a very wet, grassy path towards Loch Ailsh and Benmore Lodge. The scene that greeted me at Loch Ailsh was so stunning that it stopped me in my tracks. The loch was flat calm and reflecting the surrounding hills like a mirror, with Benmore Lodge at the far end of the loch complementing the scene. I stood for some time taking it all in, half expecting Mel Gibson with his face painted blue to appear with his army in the distance as I tried to capture it all on my camera. Passing the lodge, I followed the River Oykel into the valley as the terrain became wilder and path eventually petered out. Abandoning any idea of following the GPS in the futile hope of locating a path, I made a beeline for the pass by Conival in the shadow of Ben More Assynt and endured a horrible uphill slog through tussocky grass and bogs, the ascent made more difficult by my illness, which appeared to be draining my energy. Finally, I reached the narrow pass and followed a rising path as great views opened out to Loch Assynt and the surrounding mountains. During the long descent, a combination of the hot sun, the early start and my cold virus began to take it's toll on me and I began to tire rather dramatically as I plodded along the track to Inchnadamph and headed to the hotel in the hope of getting a drink. Arriving at the hotel, an unwelcoming 'No Vacancies' sign taped to the door did nothing for my spirits and if this wasn't enough, a man who I assumed to be the manager emerged from an outbuilding to inform me that there was nowhere I could get a drink! Gloomily, I trudged back up the track a little to a camping spot I had earmarked on the river bank on the way in to the hotel as I nervously eyed the looming black clouds building up on the mountains and managed to pitch my tent just in time as the heavens opened. I crawled into my sleeping bag and immediately fell asleep for over three hours. I awoke at round 6.30pm to discover that the rain had stopped and immediately took the opportunity to get out of the tent to cook some food. 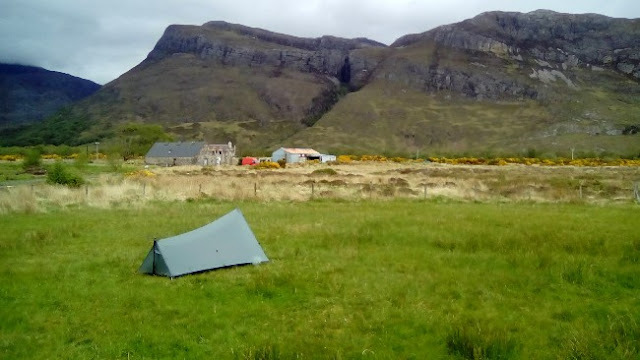 Having struggled to eat wearing a headnet to protect me from the midges, I was looking forward to a cup of coffee but it started to rain again so I dived into the sleeping bag once more and read until I began falling asleep. I was woken by rain falling on the tent a few times in the night and took these opportunities for more coughing fits and noticed that I was aching and shivering and wondered if I was actually in a fit state to get much further along the trail. In the morning, the rain had stopped, although the cloud was very low and the conditions depressingly gloomy and I realised that I was not well enough to carry on with the walk. I reluctantly decided to return to Ullapool and rest up there while I planned my next move, so packed up and headed out to the road and began walking south. It was 6.40am on a very gloomy Sunday morning so there was hardly any traffic on the lonely road and when the occasional car did appear, I wasn't yet in the mood to hitch a lift. The road passed through some fairly inhospitable looking countryside and as I began to feel more awake, the amount of traffic increased and I began hitching. I was soon picked up by a young couple and their baby holidaying in the region and they took time to move luggage around to create a space for me in the back of the car. I couldn't have been more grateful and soon, I was being dropped off by the harbour in Ullapool, having only left a couple of days earlier. My Cape Wrath walk was over, for now at least.